We all love a little bit of ‘geek’, but sometimes fear of the unknown keeps us bound within the age-old inventions and traditions. Your home is your haven, so don’t be afraid to put technology to good use. From cleaning and baking to lifestyle entertainment, it’s high time we all got in touch with our inner geek. Discover and enjoy all the technological salvations in store. First there were smartphones, now there are smart homes. These homes integrate home technology systems to automate and simplify daily activities. They seamlessly marry and manage security, climate, lighting, television, music and window blinds. This whole-home approach will not only make your life simpler, it will reduce your energy consumption and footprint, and enable you to measure your output as you go. 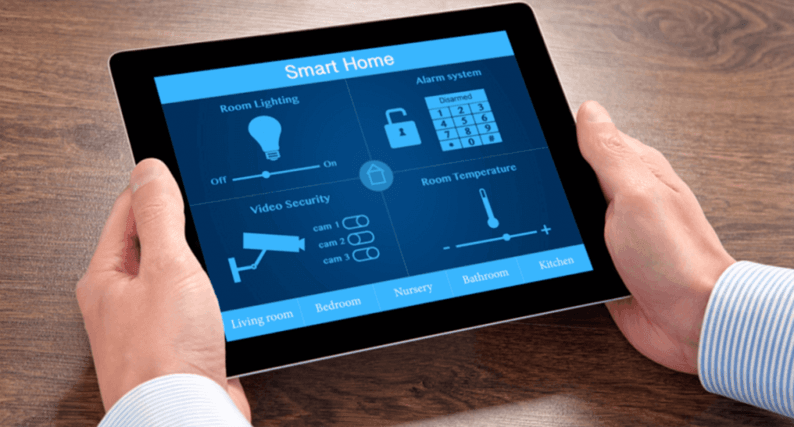 Formerly a domain reserved for the rich and famous, home integration systems will soon be considered the norm — a prediction that experts believe is not so far off. Most people already use their smartphones as alarm clocks, so now they can start making their coffee before leaving bed. There are companies that specialise in the installation of integrated systems that can be so smart they can even operated, monitored and managed remotely. We’ve gone from carpet sweeper to Hoover and now, the floor cleaning process has made strides towards futuristic robot. The first robot vacuum was designed and produced by Swedish home appliance company Electrolux, and one of its first versions, the Electrolux Trilobite, was featured on BBC’s ‘Tomorrow’s World’ in 1997. Then came Dyson’s DC06 in 2001, but an expensive price tag meant it never made it to production. A year later, American company iRobot launched the Roomba with a relatively conservative number of units. They needn’t have worried though, as the Roomba was embraced by consumers and declared an immediate success. Since then many other makes and models have launched, some at budget-friendly prices. They can clean any type of floor — from wood and tile to carpet, are able to sense walls, stairs and be pre-programmed to move around the house quietly even when you aren’t home. This is a great feature for those who disappear off to work and like nothing better than to return to a clean house. Obviously, any stubborn dirt is best removed with a hand-held vacuum or mop, but for a general clean, the robo vacuum may be worth its salt. The market for household vacuum cleaners and other automated cleaning devises are projected to grow to $1.8 million by 2020 according to a study Research Beam. The Thermomix is good for those who have little time to prepare meals. Set it to a particular recipe and using automatic cooking (all you do is add the ingredients), it will take it from there. Imagine an extra set of hands in the kitchen. These hands do what you ask and don’t give you any attitude. They chop, beat, mix, mill, knead, blend, stir and steam. The German invention, the Thermomix, is the culmination of 40 years research and development. Despite being quite luxurious, (around $2,000), the machines have taken many Australian kitchens by storm while heralding the arrival of several all-in-one competitors. Its price tag means it’s not a spontaneous purchase but one you will weigh up while considering your kitchen needs. Benefits include its compact size and recipe chip which provides access to more than 200 different recipes. You don’t even have to be a whiz in the kitchen as it will guide you every step of the way. Unfortunately you cannot just buy online or in store. You must book an in-home demonstration with a registered Thermomix consultant. All the information can be found online for those who like the idea of this one-stop-shop appliance. If you are worried about home security or want to keep an eye on young children or pets, CCTV offers peace of mind. You can buy each piece of technology independently but there are many packages available offering good value. Though you can purchase pieces individually, it is generally less expensive and easier to buy a bundled security system. At minimum, your system should have 1-3 cameras, a DVR (digital video recorder), appropriate wiring (siamese and BNC cables) and power cords. Unless you are choosing to monitor a large area, wireless cameras with wall mounting should cover your needs. Some security systems have the ability to be monitored remotely. Check out our interactive on home security for further tips on improving your home security. If wanting better peace of mind, find the right home and contents insurance for you. Get a quote with Budget Direct. Invisible bookshelves: Buy sturdy L-shaped wall brackets. Do several clusters for a creative, innovative effect. Slide one book on the jutting ledge between cover and book, then stack. There are clips incorporated onto the ledge with which you can secure the cover of the book. Store electrical cables and the like within a toilet paper roll which can then be easily accessed when stacked neatly facing up within a storage container. Charging drawer: Another genius idea for those of us who are always looking for phone and tablet/notebook chargers, create your own hideaway charging drawer. Secure a power board to the back of the drawer using double-sided tape and create an outlet at the back for the cord. Simply plug it in and charge away. Router box hideaway: Router boxes can ruin the zen of your desk or room. Hide them away within a decorative box, faux book or storage drawer. Just cut holes in the back for cords. Toilet paper rolls for tidy cables: Store electrical cables and the like within a toilet paper roll which can then be easily accessed when stacked neatly facing up within a storage container. Storage stairs: Another geeky idea for those living in apartments with limited space is to convert the bottom stairs of your stairwell into a set of extra drawers for storing odds and sods.